As events have unfolded since Mali’s coup d’état on Thursday, much has come to light concerning the coup’s apparent leader, Captain Amadou Haya Sanogo, President of the Comité Nationale pour le Redressement de la Démocratie et la Restauration de l’Etat (CNRDR, or National Committee for the Return of Democracy and the Restoration of the State). As described in the previous post, he received military training in the United States, from the Defense Language Institute and the U.S. Army. He has also said that he received training from the U.S. Marine Corps in Quantico, Virginia. 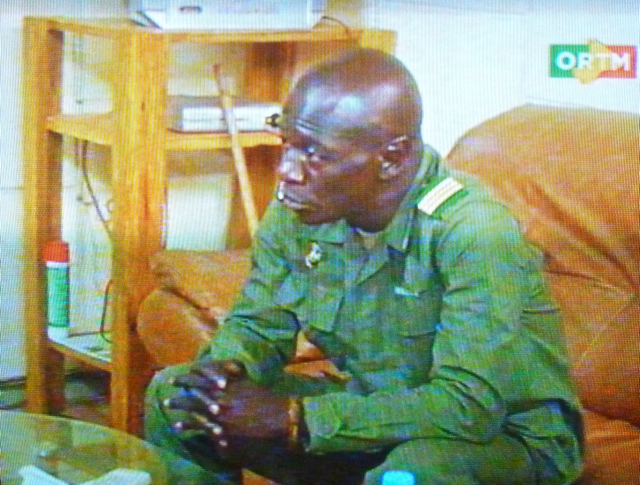 A USMC pin is clearly visible above his right breast pocket in the image below, from his interview with Africable TV on Thursday, the first day after the coup. He wears standard-issue camouflage fatigues and the green beret worn by soldiers in all regular units of the Malian army. You can also see a white t-shirt beneath his uniform. On Friday, the second day after the coup, however, Captain Sanogo began to adopt some new elements into his wardrobe. 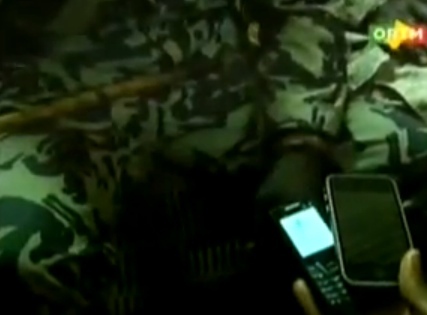 In the image below, he wears the same uniform, beret, pin and white t-shirt, but there’s something else visible as well, brown in color, between his t-shirt and his fatigues. What is this new garment? My suspicion — one shared by many Malian viewers — is that it’s a dyed cotton shirt known as dozofini, which literally means “hunter’s cloth.” As Florida State University anthropologist Joseph Hellweg illustrates in his absorbing ethnography Hunting the Ethical State, hunters in West Africa are renowned not only for their prowess at killing game, but also at controlling mystical forces of the bush. Those initiated as hunters are believed to possess special powers, such as the ability to become invisible or to transform themselves into animals; their smocks contain amulets that can supposedly render them impervious to bullets or blades. In donning this garment, Captain Sanogo is sending a message to Malians that he is powerful and can withstand attempts to kill him. Interestingly, he was first shown wearing the dozofini on Friday evening, after rumors circulated that he had been shot dead in a counter-coup, and the CNRDR felt compelled to broadcast statements that he was alive and well. 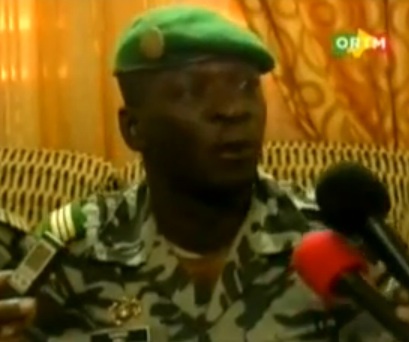 In every subsequent television appearance, Sanogo can be seen with a dozofini under his uniform. And there’s more. 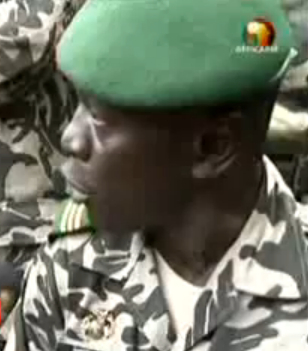 Eight minutes and 33 seconds into Friday night’s ORTM news broadcast, while Sanogo is alleging that ill-intentioned individuals somehow acquired military uniforms and looted parts of Bamako on Thursday in a bid to tarnish the CNRDR’s image, the frame descends seemingly accidentally to Captain Sanogo’s lap, before moving back up to his face nine seconds later. On the left side of the image above we can see some kind of wooden stick, called a bèrè in Bamanan. 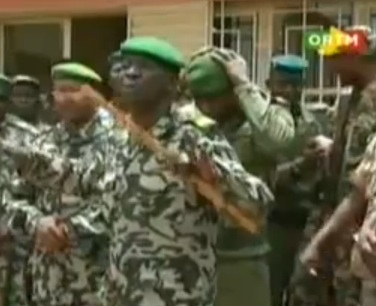 It reappears in every subsequent shot of Sanogo during the newscast, for example while he is addressing civil service directors on Friday (below). Even during a meeting with visiting dignitaries on Saturday, his bèrè is visible leaning against the shelves next to him. Now, all this speculation about the haya could be misplaced. It could simply be that Sanogo likes the flair of his bèrè. Maybe he is imitating the style of pre-colonial kings in this region, who often carried such sticks, or of post-colonial strongmen like the late Mobutu Sese Seko, whose carved walking stick became part of his public image. 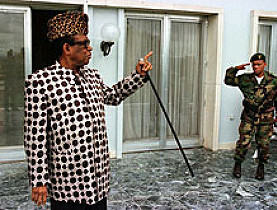 But I suspect that Sanogo is consciously displaying these items in front of the cameras as props to boost his authority, and to dissuade potential enemies from trying to harm him — just like Mobutu did. Whatever skills he may have acquired from his military training in the United States, it’s obvious that Captain Sanogo remains adept in the subtleties of his native Mande culture. Let’s remember that Sanogo’s middle name — customarily, for Malians, the name of his father — is Haya. This entry was posted in Uncategorized and tagged amadou sanogo, bamako, coup, mali. Bookmark the permalink. Hi Bruce–This is Vicki Rovine. I came to your house for dinner with Isaie in the fall. I wanted to congratulate you heartily on your book, and tell you that I started looking at your blog as these events started, remembering that you had given me the info on it. I’ve found it very interesting and insightful. I’m praying this will all start to clarify soon, with no further violence and a restoration of good governance. Thank you for putting your observations on “paper” for others to read! Nice to hear from you Vicki. Hope all is well in Gainesville. It seems to be that the Marines pin is also a power object. Great thoughts, Bruce. Really! Notice that even when his uniform changes, the pin remains. I wonder if he got any USMC tattoos while in the US? What a beautiful details you came up with! I be ko kolosi de! Thanks for this different point of view! Very interesting! Especially the hunter-approach strikes me, as they were as well seen as guards of justice etc. very interesting, thank you for your analysis! Great information. Where is Mobutu with his stick? Gone. Power lays in People. I completely adore this article! absolutely going to have to add this to the list.